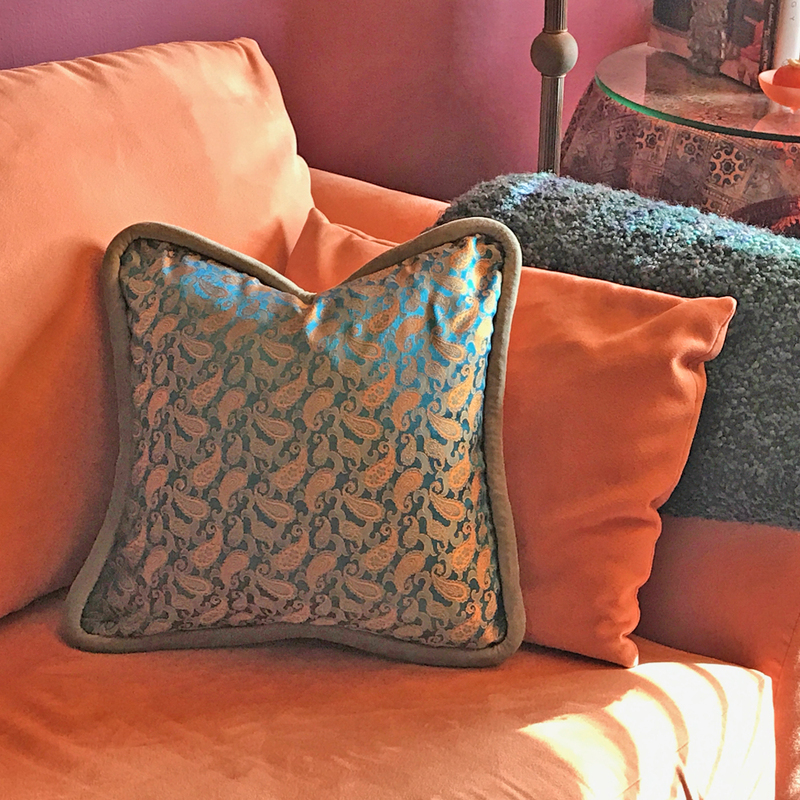 It was a couple of personal decorating projects that set me on the path to developing a line of decorative throw pillows. It all started with a table cloth and an occasional chair. 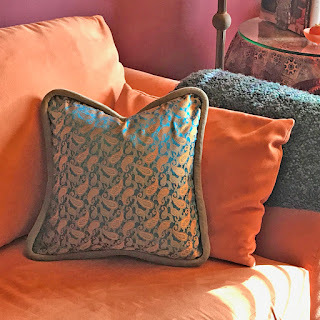 I was in pursuit of a floor length cloth to cover a round end table that sits beside a sofa. But my search only brought me to dining room lace and linens or commercial cloths for conventions and events. I was disappointed but determined. Now on a mission, I decided to visit some local fabric stores in San Francisco. It was an "'aha" moment to discover not only the zillions of fabric options, but all the fanciful trims that set my mind reeling. I was completely infatuated. Onto my second project, I began to see a distinct trend emerging while canvassing the furniture stores and browsing online. Most upholstered furnishings were solid neutrals in shades of gray, beige, taupe and occasionally black or brown. Never boring, they were always staged with fantastic pillows in a variety of prints, textures, and colors galore. It's a smart decorating concept. A couch, bed or any large piece of furniture presents an expansive backdrop that frames the pillow and catches the eye. Even though I was looking for a chair, I found myself constantly distracted by the allure of the throw pillows. The shopping exercise certainly sealed the deal for me. I was now hooked on this fabulous home accessory and ready to express my creative muse. 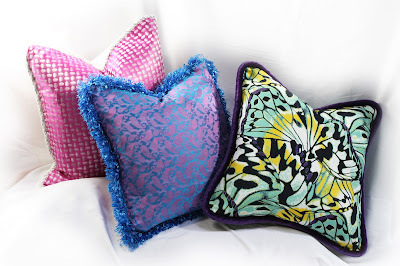 The added dimension of a double sided pillow is a sweet bonus and should not be overlooked. 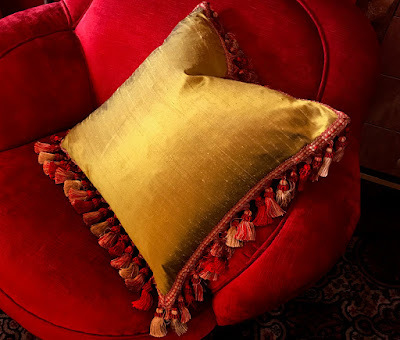 Since the pillow generally leans against the arm of the chair or sofa, there's always a little bit of the backside in view. 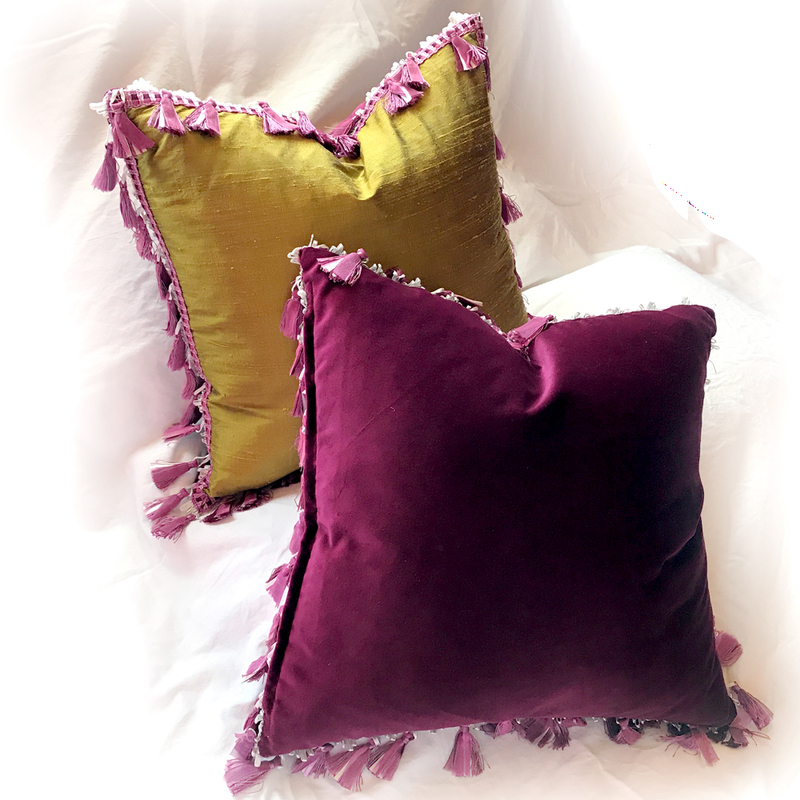 Even when the pillow is positioned frontal, a common way to display a down pillow is to create a wedge shape that reveals a peek of the backside. Sometimes I enjoy changing the ambience of the room by flipping the pillow. I love to do this with bedding. It's also a great way to group pairs. Silk from Persia - Really! 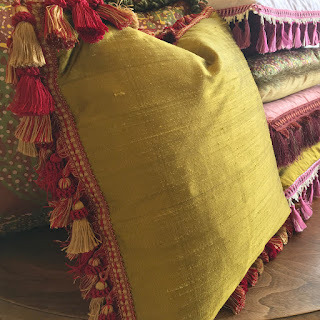 Delving into my cache of collectible fabrics was a good place to start the design process. But sourcing unique hand printed silks through my travels continues to add to the creative fun. It was clear I had my design formula ready to take shape. 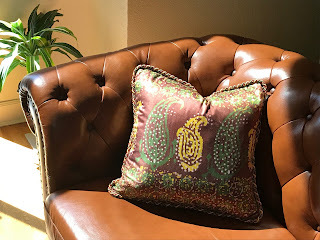 Luxurious printed silks and velvets combined with fancy trims in sumptuous color combinations that feel modern, contemporary and maybe a little edgy - these are the components of a Posh Pillow. It's the ideal home accent that finishes the room with a touch of flamboyance. No pun intended, but a luxurious decorative throw pillow is often the best way to add some out of character taste in color and pattern without leaving your comfort zone! Be sure to check out the collection in our web store!